All right, I confess. I love .45 ACP handguns. From my first exposure to the 1911A1 pistol in high school ROTC, I was hooked. I remember the buzz around the room as my fellow cadets repeated the legends: “One hit from this baby, and you’re a goner.” “The .45 will knock you right off your feet.” “Man, it really kicks when you shoot it.” And of course, “No one can hit anything with it except close up.” Gee, this must be some pistol to inspire such awe and controversy, I thought. Well, not all of the legends are true; it really doesn’t really knock a man down, one hit doesn’t always do it, the kick isn’t really that bad once you learn to shoot it, and the old .45 was probably more accurate, on the average, than most people can hold. But still, the big pistol had a fascination born of those legends, and not too many years later, I had to purchase one for my very own. It was my personal handgun through my days as an Army officer, and later I even packed it when I served in the National Guard. That well-worn Ithaca “lend lease” 1911A1 wasn’t a thing of beauty, but I learned to shoot it well. I later morphed it into a passable excuse for a target pistol, complete with an accuracy job, rebluing and adjustable sights. It was the first of many .45s for me, and the love affair still isn’t over! Today, the stopping power of modern hollow-point .45 ACP ammo, combined with the new concealed-carry laws enacted in most states have made compact .45 ACP pistols all the rage. The politically correct ban on magazines with a capacity of more than 10 rounds has made the .45 king again. If you are restricted to no more than 11 rounds, you might as well make them .45s! 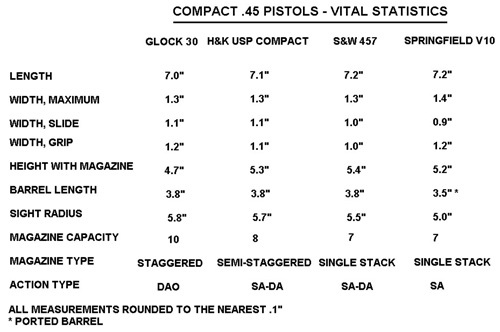 Firearms manufacturers have fallen all over themselves in the rush to produce compact .45s to meet the market demand. There are a lot of pistols out there that look like attractive bets for the concealed-carry permit holder who wants to have a good compact .45. Out of all of these, I decided to pick four of the more popular pistols for a critical examination of technical features, dimensions, handling characteristics, concealability, and shooting impressions. I wish I could have included them all, but I thought that these four would be representative of the genre, and fun to shoot, as well. They are, in alphabetical order: the Glock Model 30, the Heckler and Koch USP Compact, the Smith & Wesson Model 457, and the Springfield Armory V10 Ultra Compact. First, let’s compare some vital statistics on these guns, and then we’ll examine their features in more detail. A few notes are in order on the statistics above. 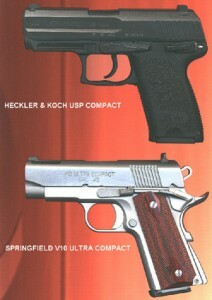 The H&K compact was measured with its flat base plate magazine, which is best for concealed carry. As an option, you can use the magazine with the finger rest magazine base plate. In fact, the pistol comes with one of each. The finger rest magazine gives you a little more room for your pinky finger, but tends to show through clothing a bit more prominently when the pistol is carried concealed. It would add a couple of tenths of an inch to the H&K’s height measurement. The Glock 30 was measured with its standard 10-round magazine in place. If the optional 9-round magazine were used, you could subtract a couple of tenths of an inch from its height measurement. The Glock comes with the factory with two 10-round magazines; you will have to purchase the 9-rounder on your own if you want one. However, the 9-round magazine leaves your pinky finger dangling and you must curl it under the grip as a result. I think Glock made the right decision – most folks will prefer the 10-round magazine for better handling and the extra capacity. 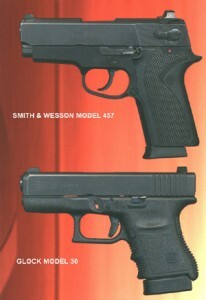 As you can see, the Glock is still the shortest of these four pistols, even with the larger magazine. The Springfield V10 Ultra Compact was measured with a Wilson Combat 7-round magazine in place. If you were to use the 6-round magazine provided by Springfield, or the Colt magazine of either 6 or 7 round capacity designed for their Officer’s ACP, it would reduce the height dimension by about 2 tenths of an inch. The Wilson mag does have an extended base plate, which is fine with me – it helps prevent pinching when you slam a new mag home during a reload. Most serious 1911-style pistoleros will opt for extended base plates on their mags for this reason, and the Wilson is one of the more popular brands. This configuration is almost standard for compact 1911-style pistols, and doesn’t make for lessened concealability.